Mike Stuart is a postdoctoral researcher at the Centre for Philosophy of Natural and Social Science at the London School of Economics. He uses the methods of philosophy, x-phi and sociology to study the different epistemological uses of imagination in science, and is the head editor of the recently published Routledge Companion to Thought Experiments. A post by Mike Stuart. When I get mad at my smartphone because it freezes, or when I plead with my car because it won’t start, I’m treating a non-human object as if it had beliefs and goals. This is mostly harmless, but in science it can obscure the truth. For Aristotle, rocks fell down because they were trying to get to the centre of the universe, and flames reached up to rise above the air. It took more than a millennium to overturn this natural way of thinking. Similar sentiments can still be found in scientific practice towards everything from molecules to economies. Recent work shows that there are at least two ways scientists use their imaginations to take up the perspective of non-human objects. I want to suggest that while one can indeed be dangerous, the other is not, and might even be necessary for science. This discussion is increasingly important to have, as our interactions with inanimate objects (especially computers) grow more and more complex. Let’s look at two scientific examples. The first concerns the Mars rovers: Curiosity, Spirit and Opportunity. In what follows I’ll be drawing exclusively on Janet Vertesi’s exciting sociological work. Here is a selfie that Curiosity took of itself (#MarsRocks?). Rovers like Curiosity are controlled by a team of about 150 international scientists. Commands take from 7-22 minutes to get to the rovers, which can only do one thing at a time: move, look, or measure. This is because of weight constraints. The more powerful the AI, the more hardware you need, the heavier it is, the more power it needs to move, and so on. So the team sends all the day’s commands at the beginning of the day, to save time and power. Deciding what the rover will do isn’t easy. You get all the data from the previous day, and then you have an hour to decide what it’s going to do next. To make decisions, everyone on the team teleconferences in and says what they think the rover should do. The engineers only send commands that receive unanimous support. Perhaps because of this, they’ve learned to speak as one: WE are the team, WE are the rover, and WE’RE ready to move 4 meters to that crater and take some rock samples. This makes sense; if the rover gets stuck, it’s everyone’s problem. These scientists imaginatively swap perspectives with the rovers in both directions mentioned above. First, they imagine the rover as a human (anthropomorphism). Second, they imagine themselves as the rover (what Vertesi calls “technomorphism”). To make the rover human (anthropomorphism), they give it human features. Its wheels are its feet, its cameras are its eyes, and its rock abrasion tool is its sense of touch. The rover “knows” when it’s cold and is “drained” after a hard day’s work. And different rovers have different personalities. Opportunity never had to work hard; she’s a glamour girl. Spirit is a tenacious blue collar laborer. She started life with a rough landing and worked until she died from injury and exhaustion, bless her heart! But not all remotely-operated space exploration missions use both kinds of imaginative perspective-taking. 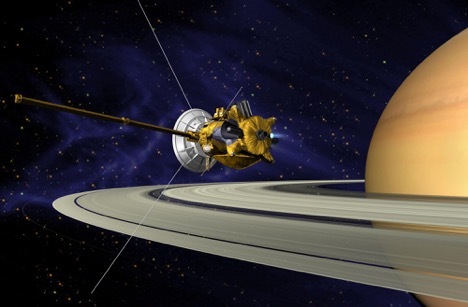 The Cassini spacecraft was launched in 1997 to study Saturn. It has since discovered 7 new moons, clouds and lakes on Titan, and evidence for a salt water ocean under the ice of Enceladus. Unlike the Mars rovers, the scientists in charge of Cassini do not imagine the spacecraft as having human features. Perhaps this is due to the organizational structure of the project: where the Mars rover teams take joint responsibility for the whole craft, the Cassini mission has many independent teams that individually control specific instruments – parts of the spacecraft – and each team has to bargain and “battle” with the other teams for operation time and system memory. The teams are not “one” with each other, or with the robot. (See Vertesi’s new project: “The Social Life of Spacecraft”). Nevertheless, Cassini won NASA’s highest success rating from a review panel in 2014, higher than the Mars rovers. This inspires the following thought. Maybe, of the two kinds of imaginative perspective-taking, anthropomorphizing is not necessary for our best science, while technomorphizing is. Anthropomorphizing is certainly helpful for team unity and personal motivation, and it doesn’t hurt as long as scientists don’t make any definite claims or decisions about nature based on some imagined human qualities of the rover. Using imagination to technomorphize, on the other hand, is a use of imagination that does seem necessary, or at least, we don’t know how to do much robot exploration without it. We have to put ourselves in the positions of space robots (or their instruments) to know how they are oriented in relation to other objects, to interpret the data they produce (e.g., images and spectroscopy data), and to decide what to do with them next. If this is right, maybe the lesson can be generalized. Instead of talking about technomorphism, perhaps we can talk about any time we use imagination to diminish or remove properties we believe we have (like a temper, or hands), and add or amplify other properties, in order to reason about how things might be from another perspective. This works for animate or inanimate objects. Instead of imagining that I’m a Mars rover with wheels and solar panels, I can imagine that I’m a point charge near a source of electromagnetism, or a human near a black hole, getting spaghettified, or I’m me, but looking down on the entire earth as a cannonball is fired into orbit. Or I can pretend that I’m a demon who is small enough to isolate fast-moving from slow moving particles without adding any energy to the system. Or I can imagine I’m chasing a light beam to see what happens as I catch up to it. Perhaps what I’m doing in all these cases is empathizing with (or imagining the experience of) a version of myself that has very different properties than I actually have. This sort of thing is very important for scientific inquiry, and it is not dangerous in the same way that anthropomorphizing is; for one, because it doesn’t tempt us to impute goals, beliefs or feelings to things that don’t have goals, beliefs or feelings. That’s not to say that it always goes well. If I imagine that I’m at the edge of a black hole, I may imagine things that probably would not happen, like my voice getting deep and warbly as if I were drowning in slow motion. But this is harmless when we keep the purpose of this use of imagination in mind: the point is not to give us true answers about reality, but to help us imaginatively extend our eyes, hands and minds to places where they cannot currently reach. Instead of homogenizing nature to resemble ourselves, we use imagination to try on nature’s shoes. Our imaginative, empathetic interaction with all sorts of non-actual, non-human perspectives in science is therefore neither a weakness nor a strength: sometimes it’s one, sometimes the other. And there are many, many other ways that scientists use imagination. Learning how scientists do (or should) harness the powers while avoiding the dangers of scientific imagination requires even more careful social scientific and philosophical research into scientific practice and pedagogy than we’ve seen so far. This post was inspired by talks given at the University of Waterloo, and the Inter-University Center in Dubrovnik. Thanks to Amy Kind and Margherita Arcangeli for comments on an earlier draft.